That Saturday, New Paltz had its first 70-degree spring day. Students, families and residents flowed out onto the streets, campus quads, and trails to enjoy a warm day after a long, cold Hudson Valley winter. 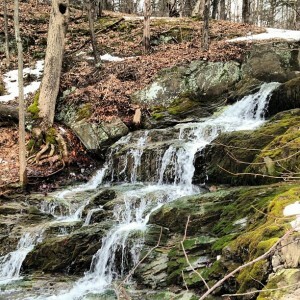 I took the opportunity to walk the Rail Trail, a popular 24-mile wooded hiking trail, with a close friend. After walking a quarter-mile, the lace of one of my boots came undone. As I stopped to tie it, I noticed a large, black, tick-shaped insect crawling on my arm. Without letting a second go by, I screamed, brushed the insect off my arm, brushed off the rest of the body, and ran towards a nearby crosswalk. “Today is absolutely beautiful, but we should come back another day, when we’re dressed more appropriately for the trail,” I nervously told my friend, realizing that my place of tranquility was starting to feel more like a cause of unease. I had dressed in a white tank top concealed by a lavender long-sleeve cardigan, a black ankle-length cotton skirt and black combat boots. People walking past us were similarly clad, wearing short-sleeved t-shirts, shorts and mid-calf leggings, sneakers and the occasional open-toe shoes, exposing plenty of skin to the bites of ticks and other insects. After inspecting myself for ticks, I decided to leave the Rail Trail, heading north on Route 32 instead. The Wallkill Valley Rail Trail, colloquially called the “Rail Trail,” stretches through the Ulster County village of New Paltz, from Rosendale to Gardiner, passing houses, farms, and waterfalls. 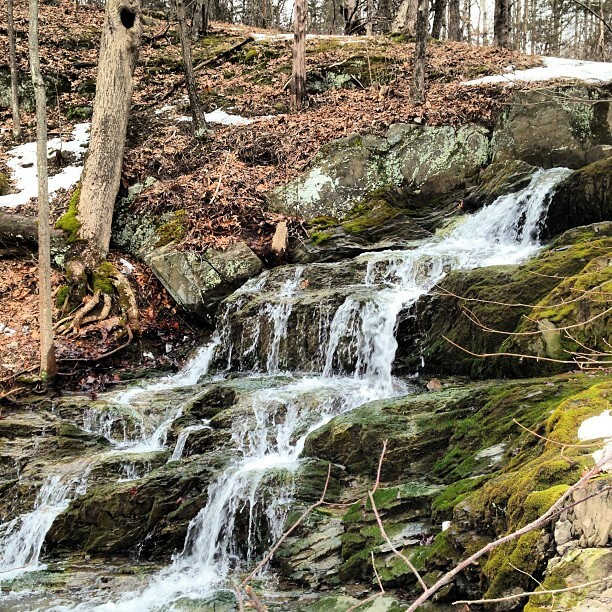 The trail allows for breath-taking views of the Shawangunk Ridge and the Wallkill River that the inner explorer can’t help but want to get closer to, even if it means walking past brush or leaping across creeks—and risking an encounter with a disease-carrying ticks and other insects. Brian Cafferty, a board member of the Wallkill Valley Rail Trail Association (WVRTA) which is mostly responsible for the conservation and maintenance of the trail, said that people aren’t regularly exposed to ticks on the center of the trail, but walking into the wooded areas off the trail is a different story. And yet, although the Rail Trail attracts pedestrians, hikers, bikers, and the like, there is nothing along the 24-mile-stretch that alerts people to the risks of tick bites and the potential to contract Lyme disease and other tick-borne illnesses. Between 1990 and 2012, New York state was home to more Lyme disease sufferers than any other state in the country, according to data from the Centers for Disease Control. According to a 2012 Poughkeepsie Journal analysis of both state and federal data, Ulster County ranked as the eighth-most Lyme-infected county in the United States. 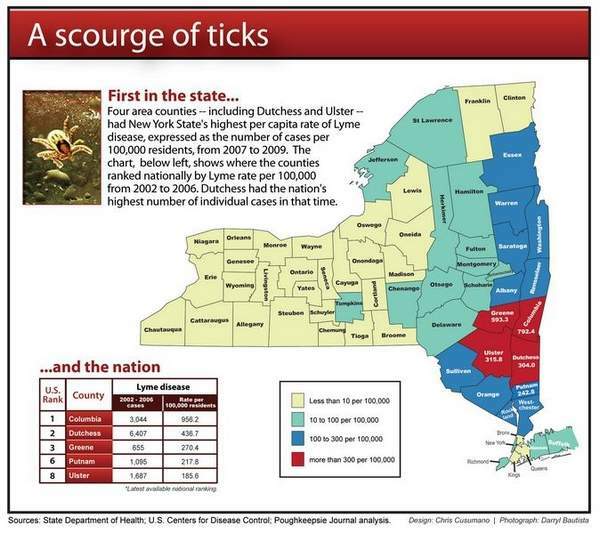 Columbia ranked first nationwide in the proportion of Lyme in the population, or per-capita, rate; Dutchess, Greene, Putnam and Ulster counties placed second, third, sixth and eighth, respectively. At every street entrance to the Rail Trail, a sign features a map of the entire trail and a few rules surrounding the Rail Trail, but no information about ticks or tick-borne disease. A few provide brochures with additional maps and historic information about the trail, also without warnings about ticks. The Rail Trail, which opened in 1991, is owned by the towns of Gardiner and New Paltz and the village of New Paltz. The Village Board’s Department of Public Works is in charge of clearing brush, decreasing the likelihood of ticks being too close to the trail. But Deputy Director of the Village of New Paltz Rebecca Rotzler said that the village board had never discussed the potential need for information about ticks along the trail. “It’s never a bad idea to state what is obvious to us. People who are traveling from out of town should be made aware that they could be exposed to ticks and Lyme disease,” Cafferty said. Part of the challenge is that the Rail Trail has doubled in length since 2009, and the WVRTA board is still grappling with that expansion. This year, they hope to install signage with updated information for the length of the trail as well as new mile markers. But at the same time, they don’t want to pollute the landscape with too many signs and warnings. Rotzler hopes to incorporate tick and Lyme disease-awareness into the welcome packet that students receive at freshman orientation at SUNY New Paltz. The board recently reinstated an Environmental Conversation Committee, which might also take on projects such as improving signage on the trail. Ultimately, the Rail Trail runs through a college town abounding in thrill-seeking students and nature-lovers who may or may not be aware of the threat of ticks, Lyme disease and other tick-borne illnesses. Everyone who has the opportunity to visit the Rail Trail should also be given the opportunity to protect themselves against a potentially life-altering disease that is ever-increasing in Ulster County and the rest of the Empire State.